Amongst the millions engaged the 500 men of the Regiment did all that was asked of them. If the story is not one of charges, hand-to-hand fights, and thrilling patrols, the fault lay with the situation and not with the troops. Thus, for three years, the cavalry lived behind the lines – employed from time to time in the trenches, used for digging new lines of defence, constructing railways, and stopping occasional gaps caused by a more than usually successful effort on the part of the enemy. Last, but not least, they were continuously training for the day when they might be used for their legitimate purpose – to penetrate to the open country beyond the miles of trench system. The 17th Lancers had their first spell in the trenches in January 1915, taking over part of the line near Festubert from the Royal Welch Fusiliers. The Regiment moved frequently during the year but there was very little to report. There was also very little to report in 1916 and 1917. On 7 March 1918, the 17th Lancers joined the 7th Cavalry Brigade, 3rd Cavalry Division. After the German Spring Offensive began on 21 March 1918, the 17th Lancers was heavily engaged. In August, the 17th Lancers took part in the Hundred Days Offensive and when the Armistice came into effect on 11 November 1918, the Regiment was at Waermaerde, Belgium. The 17th Lancers returned to Britain in September 1919 and was stationed at Catterick. First, begin by looking at the guides listed on my page to soldiers who served in the British Army during the First World War. The most important guides to start your research will be those concerning service and medal records and keep open my page on acronyms and abbreviations as the records are full of jargon. The war diaries (discussed below) aren’t great but are still useful to have. The Regimental history: A History of the 17th Lancers (Duke of Cambridge’s Own): Volume 2 1895-1924 is good but difficult to find. If you’re researching an officer or other rank who served in India with the Regiment, check the 1911 Delhi Durar Roll (free to download). Officers: British cavalry officers are usually quite easy to research, especially if a service record has survived. Check to see if a service record is held at the National Archives, I offer a copying service for these files. However, if an officer served past April 1922 then the Ministry of Defence should still hold their service record. I have written a guide on how to order these records on my other website Researching WW2: Ordering a Service Record from the MOD. Search through the war diaries below to see if an officer is mentioned. A lot of officers are mentioned in the regimental history which also contains a group photograph from May 1915. There are also lists of honours and awards of officers who served with the 17th Lancers as well as a list of casualties sustained during the war. The London Gazette and Hart’s Army List will also provide information and make sure you look at Newspaper Reports. 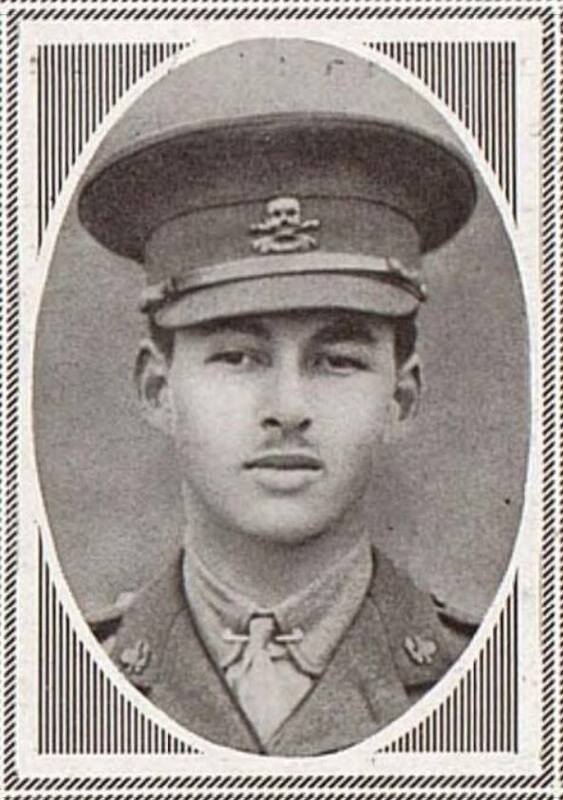 Second Lieutenant Hastings Fortescue Boles, 17th Lancers who died of wounds while serving with the Royal Flying Corps on 24 May 1915. The 17th Lancers distinctive skull and crossbones cap badge is shown clearly in the photograph. On the scroll beneath the bones are the words “Or Glory” which completes the regiment’s motto “Death or Glory”. The portrait of Boles was published in The Sphere, 31 July 1915 which is available to search on FindmyPast. Other ranks: Look for a service record but if a soldier served past January 1921 then this document should still be with the Ministry of Defence. If: Ordering a Service Record from the MOD. If no service file survived then a lot of information has been lost to history. However, there should be other sources of which medal records are the most important. The regimental history contains a list of other ranks who were commissioned as well as casualties sustained during the war. Unfortunately, no dates were recorded next to the names nor regimental numbers. If you have a soldier’s regimental number then there’s a good chance you’ll be able to work out an approximate enlistment date. Newspapers are a great resource to use, especially if you’re looking for casualties. To research a soldier who served in the 17th Lancers during the war you’ll need to search the records on FindmyPast and Ancestry. The sites offer a free trial period and if you live in Britain, you can often access them at your local library. There are four war diaries for the 17th Lancers and all have been digitised and can be downloaded from the National Archives’ website. The war diaries aren’t the best but are still great resources to learn more about the activities of the 17th Lancers during the war. To download the war diary for a small fee click on the blue links below. Notes: An average war diary at best, though there are some detailed entries in August and September 1915. There are no appendices. Notes: An average war diary for this period with a few appendices. Officers are mentioned frequently throughout. Notes: A better war diary with some detailed entries when the Regiment was in action. Notes: A short war diary with most months only having a few entries. There is a regimental history covering the First World War: A History of the 17th Lancers (Duke of Cambridge’s Own): Volume 2 1895-1924 by Major Gilbert Micholls. A useful book, not so much for its First World War coverage but for the Regiment’s prior service in India and later service in Ireland. This book was published in 1931 and hasn’t been reprinted. There is a group photograph of officers serving with the Regiment in May 1915 and the book has two and a half pages on 8th Reserve Cavalry Regiment. There is an itinerary for the 17th Lancers showing where they were during the war and how many nights they spent there. Lists of officers who served with the Regiment as well as the Regiment’s casualties but no dates or regimental numbers are recorded. Also, short biographies of all British officers who died serving with the Regiment during the First World War. 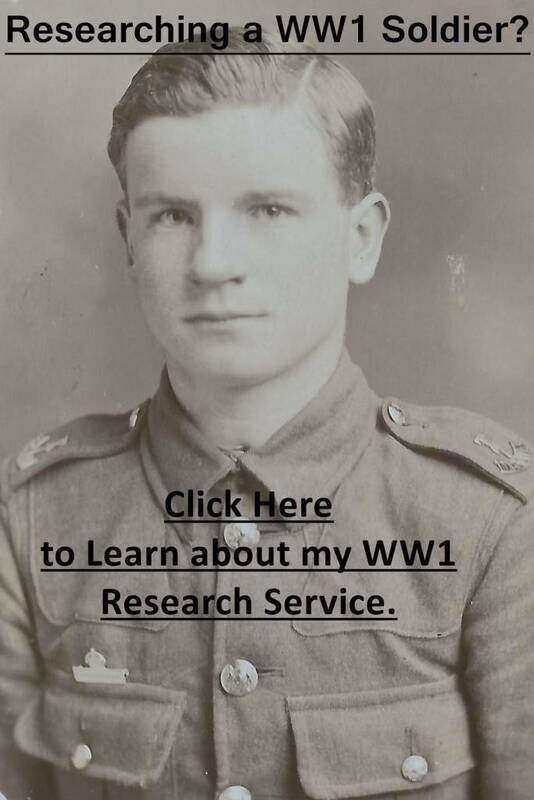 I offer a research service if you’re looking to research a soldier who served in the First World War. To find out more click on the photograph below. In the transcriptions taken from the 17th Lancers’ first war diary (WO 95/1178/3) below, the Regiment had received orders to mobilize at Sialkot. 31 August 1914: Orders received to mobilize. Medical inspection by squadrons: Number of men fit: 534. Veterinary inspection by squadrons: Number of horses fit: 482. 3 September 1914: Sharpening of weapons. 4 September 1914: Shoeing up of horses. 7 September 1914: Information received that 5 officers at present in England would rejoin Regiment at point of destination. Deficiencies in officers – 8. Field Service Strength 27, medical officer 1, [total] 28… 85 horses received from 21st Lancers. 8 September 1914: 5 Serjeants (landed 5 September) from English furlough. 11 September 1914: Promotion of Non-commissioned officers to complete war strength. 14 September 1914: 22 Private chargers inspected by kit officer. 17 September 1914: 16 men transferred from the 21st Lancers to complete deficiencies. 21 September 1914: 4 men, 15 horses, 13 sets arms, equipment, and saddlery from 21st Lancers. 22 September 1914: Information received that rifles and ammunition would be exchanged at the Base for home pattern. Mobilization completed.